LEGARDEUR DE TILLY, PIERRE-NOËL, captain in the colonial regular troops, councillor of the Conseil Souverain, son of Charles Legardeur* de Tilly, also a member of the Conseil Souverain, and of Geneviève Juchereau de Maur; baptized 24 Dec. 1652 at Sillery; buried 13 Aug. 1720 at Saint-Antoine de Tilly. In 1689 he was appointed councillor of the Conseil Souverain in his father’s absence; in 1695, however, he gave his position over to Charles Aubert de La Chesnaye in payment of a debt of 6,500 livres that he and his father had contracted with Aubert. In 1675 he had married Marguerite Volant, who bore him two daughters. In 1680 he married again, this time with Madeleine, the daughter of Pierre Boucher, the former governor of Trois-Rivières. Thirteen children were born of this marriage. At his death his wife and children were left destitute. AJM, Greffe de Jacques Bourdon, 24 nov. 1680. Caron, “Inventaire de documents,” APQ Rapport, 1940–41, 444. Jug. et délib., II, 343; III, 398, 404. Recensement du Canada, 1666 (APQ Rapport). P.-G. Roy, Inv. coll. pièces jud. et not., II, 14; Inv. concessions, II, 137; III, 88; IV, 102; Inv. ins. Cons. souv., 78; Inv. jug. et délib., 1717–1760, VI, 165, 218f., 222; Inv. testaments, II, 46; “Les conseillers au Conseil souverain de la Nouvelle-France,” RSCT, 3d ser., IX (1915), sect.i, 173–87. 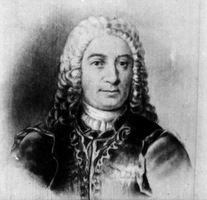 Robert Lahaise, “LEGARDEUR DE TILLY, PIERRE-NOËL,” in Dictionary of Canadian Biography, vol. 2, University of Toronto/Université Laval, 2003–, accessed April 26, 2019, http://www.biographi.ca/en/bio/legardeur_de_tilly_pierre_noel_2E.html.